Saturday 31 August. 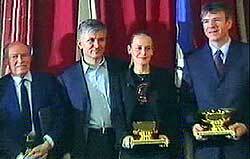 2002- Jelena Dokic got involved with politics in Serbia by giving support to Mr. Vojislav Seselj. Jelena Dokic gave support to a presidential candidate Mr. Vojislav Seselj. Serbian elections are to be held on September 28. Mr. Seselj is leader of the Serbian Radical party. It’s a right wing in a parliament political party. At the moment I am very busy but I want you to know that both my hart and sole are in Serbia. I know that the presidential elections are to be held on September 28. The destiny of the country and the Serbian people depends on the election results. I am anciently anticipating the day of your election. I am quite sure that you will win in a first round of the presidential elections because you are the only hope of Serbian people. Once you become the president of Serbia I will be able to come back. Jelena lost from Daniela Hantuchova in straight sets 2-6, 3-6. She is currently playing German open. The next tournament that Jelena would take part in would be Italian open. We have many new photos thanks to Marco and they are all posted in the photo gallery. Leading property companies around the country contacted DokicJelena.com with hot residence solutions for our tennis queen. 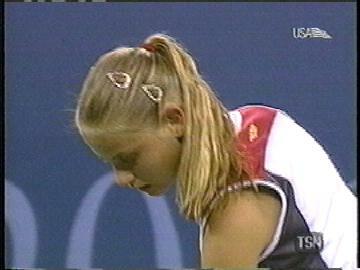 At the moment we are trying to pass the offers to Jelena Dokic herself. For example, owner of the property agency R&P, Mr. Radosevic, offers Jelena land near famous Avala peak located few miles from the city. Avala is popular for outings, hiking, picnics, and sightseeing. It is very nice peak with beautiful nature. The offered land is located near motel "1000 ruza" (1000 rouses). Estate has 270 square meters house with big living room, luxurious bathroom, few bedrooms and terraces. Whole estate has approximately 60 acres of land. DokicJelena.com is dedicated to publish new info as it comes to our news room. Next tournament of Jelena will be played on red clay in Hamburg, Germany. Name of the tournament is Betty Barclay cup. DokicJelena.com will keep you informed about new developments and scores. In the mid time log on to our message board. Jelena is very very happy in Belgrade. As soon as Savo has finished school we hope to go out there within a couple of days. In Australia we had problem with newspaper, but I think Tennis Australia must protect her , but now in Yugoslavia nobody don't make problem in newspaper, Government have given her diplomatic passport for Jelena, she can travel around the world without visa, it's much easier for her, give her support, she don't have any support in Australia, it is problem. I don't want to speak bad about country , understand, I just speak bad about a couple of people, but for example in Yugoslavia we have big support, I think it is very important for a young tennis player. About Octagon court trail: It should be one very interesting hearing. After easy opening match victory in Miami, Jelena continued playing with self-confidence. Despite her injury it looked like she could show some sophisticated tennis. Hope was crushed after match against Ane Kremer last Sunday. Dokic lost in two sets: 6-3, 6-1. After that Jelena won doubles match against Garbin/Hrdlickova 5-7, 7-6(3), 6-4 ! Jelena will play, next week, in Sarasota, Florida. After that, Jelena Dokic will take a break until end of April. Milan sent us some photos from last Sunday when Jelena played against Ane Kremer. See them here. It is officially confirmed that Dokic will attend some tournament in Yugoslavia. Ten more photos are placed in our Photo gallery that you might visit right away by clicking here. Stick with message board for regular updates. First ten photos from US open are provided by Milan and can be seen by clicking here. New photos and videos are coming. Milan will broadcast some of the best points that Jelena made during US open. Jelena will show up in next edition of very popular FHM magazine- my favorite. We are still waiting however, Jelena to get back and strike the action. During our waiting we will be analyzing new discoveries of little bit older pictures and we will be chatting on the message board. So why don't you join now. 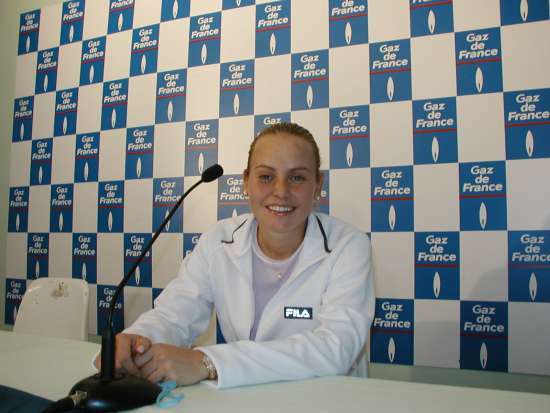 Sad news as Jelena Dokic of Yugoslavia will not be able to play in singles finale match of Open Gaz de France. She was forced to withdraw due to strain in her right thigh. She will be automatically recorded as second after Venus Williams who should have been Dokic's opponent in finales. Dokic got injured during last part of her semi-finales match against Monika Selez. After that match Jelena played one doubles match that made her injury worse. 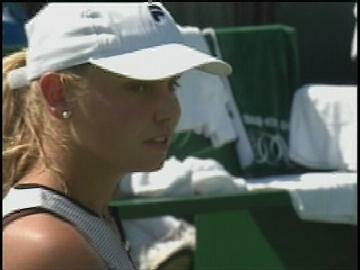 "This is a big disappointment to me," said Dokic. "I like this tournament a lot and I had a very good week. It's only the second event I played this year, so I have to be positive about the way I played. "The injury happened at the end of my match against Monica," explained Dokic. "But it didn't hurt too badly at first, as I was still warm, I went on to play the doubles (with Maggie Maleeva) but towards the end of that match, I could hardly walk and it was hurting a lot. I had treatment straight away and this morning, the doctor saw me again and there was no doubt I couldn't play. I could risk making the injury worse and be out of play for several weeks." Dokic hopes that her injury will be cured in few days and that she will be able to play inaugural Proximus Diamond Games in Antwerp on Thursday. Tomorrow, Jelena will be recorded as 6th on WTA list after she managed to be in Paris finales but also after she lost opening round in Tokyo. Up-to-minute news about Jelena's next tournament will come to message board. Dokic had to default because of a right thigh strain sustained in her semifinal singles match against Monica Seles. In Other headlines: Ibrahim Acikoz sends us screen saver and opens new multimedia future of DokicJelena.com. Milan sends us article from Yugoslav Tempo sport magazine that researches Jelena's future tactics. Dokic Jelena.com was proclaimed most interesting web site in Yugoslavia by National television's third channel. DokicJelena.com will maybe establish cooperation with world's best hotel "Harbour Plaza of Hong Kong". Visit message board now as news from Thailand will come there much before than on DJ.com front page! There is much more! Jelena is relaxing: Tennis player Dokic Jelena enjoys her free time in Tampa, Florida. She practices at the same time with her father. In recent past one airplane with crazy kid stroke building in Tampa. We hope that Jelena was not scared for a moment because Jelena's fans want only enjoyable moments for her. According to rumors she might travel to Europe and Asia to visit some beach resorts. In Yugoslavia there are some fantastic beaches and therefore I suggest you all to go there. Her smart decision to miss Australian open will give her time, energy and comfort as she will not travel all the way to Melburn (sorry I don't know how to write name of that city- don't take this wrong way) and she will not take insults of Australian media on her and her father's account. Damir is driving KIA: Father of Jelena, Damir Dokic filmed TV commercial for Korean KIA car company. It will be showed in Australia and maybe on ESPN or Eurosport. Damir even got one KIA car and he will be driving it in Florida as he likes cars. His car park will be bigger as he has many cars in his garage. Damir likes driving fast. In fact he worked as a driver of trucks when he was in Yugoslavia. "We're not the largest car company in Australia and so we had to come up with a striking image that wasn't going to cost us a fortune," Kia spokesman Edward Rowe explained yesterday. Kia's research showed that pictures of the much-maligned Damir Dokic were recognised by 98 per cent of those who were shown them. Then of course, Mr Rowe rejoiced yesterday, one of the beauties of using Mr Dokic was that he wasn't associated with any other product, it never having occurred to any other company to use so hated a man to sell their precious product. "He's definitely got the Wow! factor" Mr Rowe said yesterday. "People will see him and they'll say 'Look who it is on the TV! I've got to sit down and watch it!' We believe that sports marketing should also be fun, especially against the backdrop of such a prestigious event as the Australian Open." Kia is a sponsor of this year's Australian Open. "In the ads he mocks a particular aspect of his personality," Mr Rowe explains. 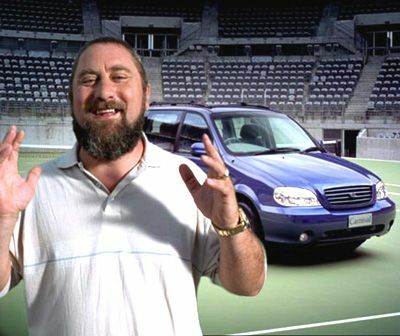 So for example in one advertisement, referring to the famous incident at the 2000 US Open in which he was thrown off the National Tennis Centre after complaining loudly and bitterly about being charged $10 in the players' lounge for a piece of salmon, Mr Dokic praises Kia for openly "including everything in the price" when they sell you a car. Mr Dokic's contributions to the advertisements were filmed in the United States near his Florida home. Ms. Dokic said that she wouldn't be playing in the 2002 Australian Open because "it's too far away" from her Belgrade and Florida homes. I am going to feel Thailand's tennis experience: Thailand is only one country that has not been colonized in whole south east Asia. However there are many influences of west and globalization. One of them is tennis. More and more people of Thailand play tennis every day. It has numerous future world's tennis potential stars. Therefore I will not be going to Thailand only to sit back and relax in beautiful beaches but to make photos and videos of young tennis players as well. That is important mission because it can show us in which direction today's tennis is going. That's all will happen in beach resort and one WTA tournament base- Pattaya. Ibrahim Acikoz sends us screen saver and opens new multimedia future of DokicJelena.com: Ibrahim Acikoz, new member of DokicJelena.com staff sends us beautiful screensaver. Link toward it will be posted here and in Wallpapers section. It is 4.05 MB big, but that does not have to discourage you because when you get it done once it will be forever there as official screen saving tool of your personal computer. It is absolutely marvelous. Go to address below and download screen saver. Our wallpaper section is updated. You can find new wallpaper there. It is called Flaming Jelena in front of Damir. News archive is also updated. Milan sends us article from Yugoslav Tempo sport magazine that researches Jelena's future tactics. One year ago, Jelena Dokic was 25th tennis player in the world. At that time, She had dreams to finish that season in first 15. She did not make her goal but she made much more. Today she is 7th in the world. Modesty is main mark of her look toward future. In 2002 my biggest whish is to be where I am now- in top ten- she says- everything else will be more than I plan. However, The skill she has displayed last year gives her the right for much bigger ambitions for future times. In 2002 she has not made advance in one thing- she lost match against Linsday Davenport at beginning and at the end of season and she did not find solution for game of tall American lady. Whole year Linsday has made problems for Jelena, but on the end of the year Davenport was proclaimed best tennis player of the year. It is not so bad after all to lose from world's best tennis player. Especially in the finals. Every other aspect of Jelena in 2001 offer enormous encouragement. From eight level of tennis pyramid, best Yugoslav tennis player has all the reasons to go toward very top without of too much worrying about players below her. According to points, Amelie Muresmo is near Jelena as she won many titles in previous year. for her It is even hard to stay where she is now. Before of Dokic there are Justine Heinin and Serene Williams. They all have similar points so it is easy to take lead over them. Even as Yugoslav decided not to enter Australian open because of her bad experience in Australia, it will not be big handicap for her. First, she will enter Tokyo tournament without of being tired. Second Jelena was eliminated in first round of Aus open and she does not defend any points. Most of her points have been won from September to November. So in order for her to succeed, she would need to play well French open, Wimbledon and US open. Serve is still biggest problem in game of Jelena Dokic and at the same time it is the reason of lost matches against good players. Yugoslav also has often concentration failures. Against weaker players these concentration problems can be eliminated using stronger tempo but it does not go that way with stronger ones. She already fixed her third game problem- approaching quickly to the net. Dokic has had lots of condition practices with her coach and she has time for these during winter. She has shown quality in playing from the net. She plays good on all surfaces as she has won tournaments in Tokyo, Rome, Moscow and got to quarter finales of Wimbledon. Jelena Dokic has not been defeated in finales against player who is lower on WTA list than her. She has beaten great player and won great tournaments. In Rome she won matches against Conchita Martinez and Amelie Muresmo. In Tokyo she defeated Kim Clisters and Aranchita Sanchez. In Moscow she defeated Elena Dementieva. Jelena Dokic is famous as a player who has defeated many strong players. At very beginning she won match against Aranchita Sanchez in 1999. After that she won many tennis stars but no victory was greater than one against Martina Hingis in 1999 Wimbledon. Dokic was at 129 position on WTA list and she managed to win game against tennis queen and defender of that title herself. Something like that never happened in history of tennis. After that she won matches against Mary Perce, Venus Williams, Chonchita Martinez, Ameli Muresmo, Kim Claisters... Jelena plays worst against Linsday Davenport and Monika Selez however. They will come down soon, for sure. For our best tennis player beginning of season will be at 28th January. Jelena will start in Tokyo (for award of 1224ooo dollars) Competition is very strong- from Linsday Davenport to Martina Hingis, Monika Selez and Serna Williams. Dokic Jelena.com was proclaimed most interesting sport web site in Yugoslavia by National television's third channel. In computer show of very popular television third channel that usually shows tennis matches, our website DokicJelena.com was proclaimed few days ago as most interesting web site. First Yugoslav Web site about Jelena Dokic was totally described with all it's sections about Photos, News, Interviews, Results etc. Members of DokicJelena.com staff were mentioned as well. Thanks to third channel a lot. Visit message board now as news from Thailand will come there much before than to DJ.com front page! 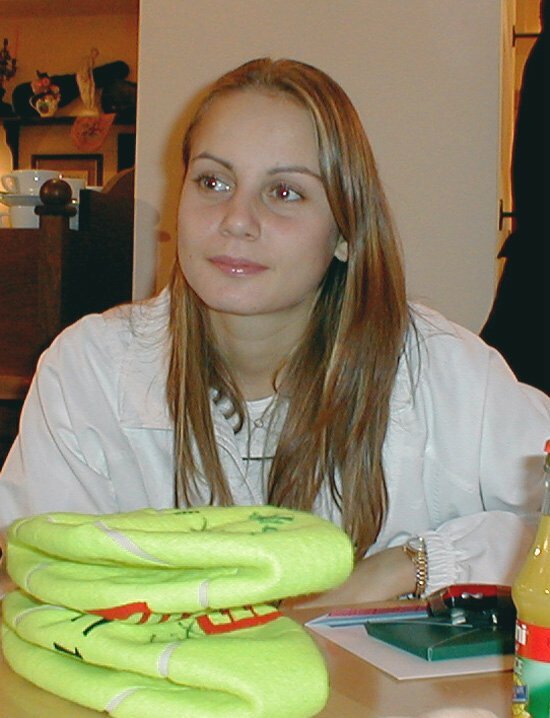 There are many members and you can talk about everything related to Jelena Dokic. That is the best way to express yourself, to find friends and chat with them. Live chats will be organizes as well. Happy new year to our queen of tennis Jelena Dokic and all fans. During this break Jelena traveled between her two houses in Tampa and Belgrade but she made new year celebration in Yugoslavia as we found out from unofficial sources. Time to sit back and relax for new year and Christmas holidays goes underway and Jelena Dokic gives first exclusive interview in new year. EXCLUSIVE: This time in New Year our web site can present first interview of Jelena Dokic in 2002 from “Vecernje novosti” daily newspapers. She conquered Rome, Tokyo, Moscow. 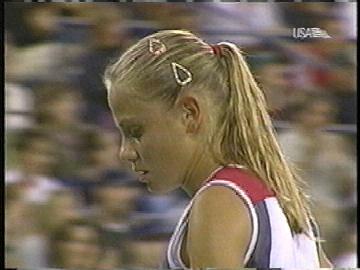 In 2001 she become eight tennis player of the world and she was proclaimed as best athlete of Yugoslavia. Can Jelena Dokic give more in 2002, can she go further to first place on WTA list, and can she become ruler of planet of tennis? That is the wish of every sportsperson. I have these dreams too. But I stand on the ground as realistic person as well. Thank you for these nice wishes. I think that I would be aggressive if I would promise such a big things. But I would highlight one important thing- I am not afraid of any opponent- says Jelena Dokic for Vecernje novosti newspaper. Last year you had plans to enter top 15, but you entered top 8. What do you and your coach father Damir expect from new year? We know that it is harder to defend position than to conquer it. We know that coming years will be much harder. But I did not start playing tennis to be afraid of challenge. Our plan for New Year is to enter top five. Last weeks Jelena is preparing herself in her second home in sunny Florida. It is very convenient because she has to go only two minutes to tennis courts from her house. She believes that hard work will give her good results like last year. However she will not start from Melbourne but from Tokyo. Why? I had hard year and rest was necessary. We don’t want to work too much because it can be bad. We evaluated that pause is really needed. Last year, Australian grand slam stayed in bad memory for you since Linsday Davenport were arranged for you in first round. That bad that have been made by Australians did not affect our decision too much. They did not have respect for their first tennis player. Now they can only regret for their behavior. I am happy to play under flag of Yugoslavia. I am happy because I was proclaimed to be best sportswoman in first year playing for Yugoslavia. You will open season in Tokyo? Usually it is said that whole year depends from first tournament. That is my opinion as well. First tournament is most important. That is the reason for my hard work. My father and me make tactic for new wins together. Our website and community of DokicJelena.com is delightful to send you Christmas and new year greetings with wonderful news about Yugoslavian and Serbian tennis queen. Tennis player Jelena Dokic was proclaimed the best female athlete in Yugoslavia in the eighth selection of the Yugoslav Olympic Committee (JOK) at a ceremony in Belgrade Intercontinental hotel on Sunday. 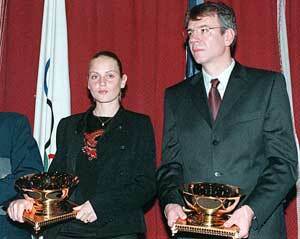 Dokic wrote history of one of the most successful sport nation in the world two days ago on Sunday 17.12.2001. Serbian Prime Minister Zoran Djindjic was there with many other special guests and lovers of sport. Beside Dokic, sportswomen nominated for that prestigious award were Jasna Sekaric, Olivera Jeftic and Mara Kovacevic. The best Yugoslav tennis player was 132nd on the WTA list at the beginning of this year, and she is now eighth seeded with triumphs at three international tournaments, in Rome, Tokyo and Moscow. Aleksandar Sostar, who is water polo player, was elected for the best sportsman in current year. He won silver on World competition and bronze on Olympic games in Sidney with his team. After official ceremony princes Jelena and king Aleksandar gave statements to the press. Great owner have been given to me. I am proud that I got this award in my first year of playing for Yugoslavia. Thanks to all for this recognition. I promise better results in the future. -Said best sportswoman of Yugoslavia in year 2001. Jelena Dokic will continue her vacation in her home country. According to talks Jelena spends her free-off season days in Belgrade house and one of the country’s mountains and ski centers. I gues all members of DokicJelena.com community have smiles on their faces and that this is best Christmas present for them. Ibrahim is new member of our staff and he helps us with new videos and screensavers. These new stuff will be realized before New Year and would be great present to all fans of Jelena Dokic. Career highlights: Hopman Cup in Perth, Wimbledon semi-finals, Italian Open in Rome, Toyota Cup in Tokyo and Kremlin Cup in Moscow. JUST CURRENT, FRESH OR PRESENT CONTENT IS DISPLAYED HERE. FOR UP-TO-MINUTE NEWS GO TO Message board. FOR OLDER NEWS, INFORMATION AND PHOTOS PLEASE REFER TO ARCHIVE.